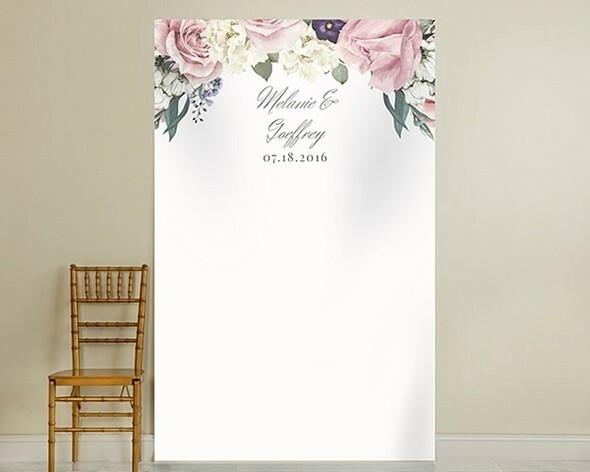 With its lovely pastel pink, green, blue and ivory floral motif, this photo backdrop is perfect for an English garden-themed wedding or shower. Better yet, it may be personalized with your names and wedding date in the pictured fonts. Available only in the colors and fonts shown. PLEASE NOTE: Mounting supplies are not included with the backdrop. Each backdrop ships in a mailing tube and is made of tear-resistant 7mil polypropylene that is water-resistant with a scratch-resistant coating.